Why Doesn’t My Baby Have Teeth? After weeks of chewing, slobbering, and crying, most parents will see their child’s first two baby teeth erupt around 6 months of age. Generally, the lower teeth appear first, which are often followed by the top 4 upper teeth. By the time your child has reached their third birthday, they likely will have all 20 of their primary teeth. While these are considered the average, every child is different. Some children may have their teeth come in sooner, while others may take a bit longer; however, if your child does not have any by 18 months old, it is time to see their dentist in Creve Coeur. Your dentist will evaluate their oral health and structures to look for any abnormalities that may be causing the delay. In some cases, it may be due to a premature birth, low-birth-weight, or simply a family trait. In rare cases, it may be the result of a genetic abnormality that causes poorly formed teeth or late eruption. Sometimes, it may be due to poor nutrition, like lack of vitamin-D. Underlying medical issues, like Down’s Syndrome or another birth defect may also be the cause. If your child has not gotten their baby teeth yet, it is natural to be a bit worried. Their primary teeth serve an important role. They help your child learn how to chew and speak while also acting as placeholders for their adult teeth. While you may be concerned about their development, most children who have delayed eruption do not suffer any long-term consequences. Unfortunately, there are times when problems can result, especially for children who are genetically predisposed to late tooth eruption. When genetics is the cause, children have a 35% increased risk of needing orthodontic intervention in the future. The American Academy of Pediatrics recommends that you take your child to the dentist if they do not have any baby teeth by the time the are 1.5 years old as a precaution. If you are concerned about your baby’s oral development, do not hesitate to contact their dentist. 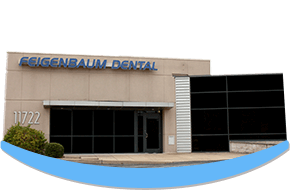 Dr. James Feigenbaum and Dr. Jenna Feigenbaum strive to create generations of healthy smiles. They treat patients of all ages. If your child has delayed tooth eruption, contact our office today to schedule a consultation.